Have a little ice cream lover in your family? Then, they will love these Ice Cream Sundae Count to 20 Cards! On each page is a traceable number between 1-20 and an ice cream sundae. The goal is to decorate the sundae with the right amount of cherries or peanuts or whatever you have on hand! 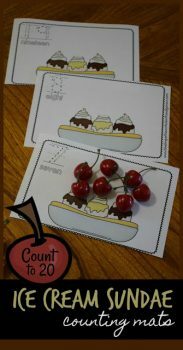 So, if the page calls for 8, then your child will put 8 cherries on. It’s a fun way from Beth at Kindergarten Worksheets and Games to really understand number value and help give them a good math foundation for the future. Get the Ice Cream Sundae Count to 20 Cards today!